1 of 1 In bowl, mix oil, lime juice, garlic, onion, cilantro, oregano, salt, cayenne and black pepper (can be made up to 3 days ahead and refrigerated, covered). 1 of 3 In plastic food-storage bag, combine 1/3 cup chimichurri sauce and steaks; seal. Cut halibut fillet into 4 serving pieces. In another plastic food-storage bag, combine 1/3 cup chimichurri sauce and halibut; seal. Reserve remaining 1/3 cup sauce. Marinate steak and halibut in refrigerator 30 minutes. 2 of 3 Prepare outdoor grill with hot coals arranged for direct grilling, or heat gas grill for direct grilling. Remove steak and halibut from marinade; discard marinade. 3 of 3 Grill steak and halibut 10 minutes, covered, turning steak after 5 minutes, or until instant-read meat thermometer inserted in steak registers 145 degres F for medium-rare, and halibut flakes when prodded with a fork. 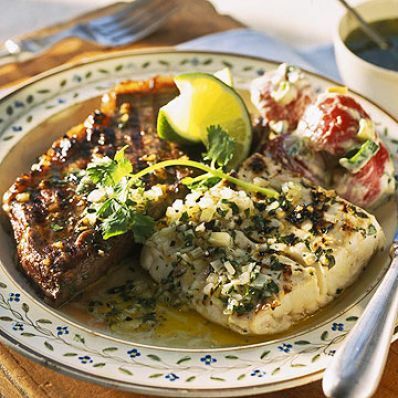 Serve steak and fish with reserved chimichurri sauce. Makes 4 servings.